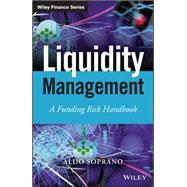 How to apply critical risk management techniques to liquidity risk control This groundbreaking book shows how to apply current theory on critical risk management techniques and processes for liquidity risk control and measurement resulting from the economic crisis and changing regulatory framework. It reviews refinancing risks for banks and shows the Basel 3 coverage ratio and long-term stable funding ratio methodologies, reviewing its components, counterbalancing capacity structure. It also includes a dedicated chapter focused on stress testing both from a regulatory and empirical standpoint, showing how different forms of financing behave differently in changing markets conditions. The author also includes information on alternatives funding sources and analysis of their resilience during market crises based on practical experience. Comparison of market liquidity and warning signals will also be included, where anticipatory indicators are effectively detecting further deterioration. Describes the recent impact of sovereign crisis on banks liquidity processes and approaches the future developments of regulations Based in extensive research, the book has insight on direct experience and reveals the challenges and critical issues concerning liquidity risk Author Aldo Soprano is an expert on operational risk Liquidity Risk in the Financial Crisis covers the recent crisis and new regulatory framework's impact on liquidity risk management, spanning techniques, processes, and banks strategies.